I am tempted to write nothing else. This card is so bright, cheerful, and full of sunshine that words almost aren't necessary! What I do want to tell you is this. I hope that you are happy today, and that your life is full of blessings, all good things, and loads of love. I am very blessed just because you stopped to visit me today! I made this card in 15 minutes using washi tape from the Delightful Ribbons and Trims collection that is on sale this month for just $30. 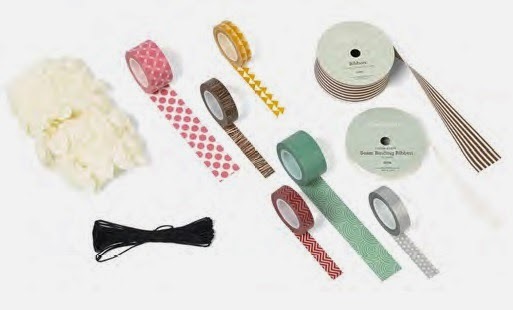 Not only are there 6 rolls of washi, but also rosette ribbon, black hemp, striped grosgrain, and color ready seam binding. I love this collection of trims! Oh this is my FAVORITE!!! Look at that flower! (Might be a perfect embellishment to say...a flip flop?) ;-) This just makes me smile every time I see it! I love that flower. The colors and all the layers are perfect.